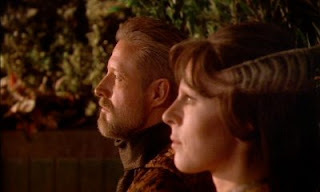 Delenn learns to cope with the loss of Sheridan in the Babylon 5 episode "Sleeping In Light". Image credit: Screenshot by Cujo359. Babylon 5 is a copyrighted work of Warner Bros. The Internet is a strange world, at least for those of us who grew up without it. Sometimes you form attachments with people who, for all you know, don't even really exist. I have such attachments, as do most of you who are reading this, I suspect. What gets really weird is that you can actually learn to miss someone whose presence doesn't reach you until after they're actually gone. From his writing, it appears that Olmsted was a fan of the show for some of the reasons I was. In the end, what your life really means is what you do, particularly in those moments when you have to make a choice. Some choices aren't easy, but it's those hard choices that define who you are. Olmsted certainly understood that. I'm not going to bother quoting much more of his article, which Maj. Olmsted wrote in case he was killed in Iraq. Have a read for yourself, and ponder what we've lost. For my part, I'm sorry that I never got to know Andrew Olmsted until he was gone.